8 million visitors have so far showed their grief and support digitally. 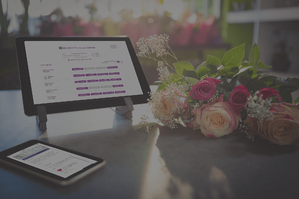 Funeral homes give the family and close relatives the ability to connect the passing of a loved one to digital solutions where you can light candles, write condolances and get practical information about the funural. This part of the grieving process makes the day a bit lighter for those who have lost someone they love. Most people are in contact with a funeral home perhaps once or twice in a lifetime. When people are in this vulnerable position we wish to start processes that can make a difficult time a little bit easier. Digital grief is such a process. The funeral homes offer a common, simple platform where you can find a community of those who wish to honour the person who has passed. The digital solution changes the way family and those who knew the departed can communicate and interact. It can make the daily life a little bit easier for the bereaved when lights are lit, a heart is uploaded or kind comments are written. It is a way for the wider and often geographically spread community to come together. To be together in the grieving process is something many people see as very positive and helpful. «The fact that 8 million visitors has engaged digitally in the grieving process indicates what it means for those who wants to honour those who have passed away”, says Hege Bjurstedt in Adstate. These digital solutions are available on the home pages of the funeral homes as well as on the Adstate portal. In addition to engaging with the bereaved, one can order flowers and make a donation.